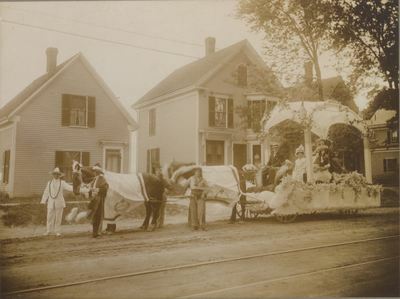 "E.C Nichols Dry Goods Co. Bangor Carnival Parade Float, June 18, 1912"
"The Nichols Co. had a handsome float in line, one that was most noticeable in the long parade, where all were good and none were poor. It was the result of a great deal of thought and a great deal of time on the part of the professional decorator of the firm E.F. Hartwell. Seated on a throne in the center of a large platform sat Columbia, representing the United States, and at each corner of the pedestal upon which the throne rested were four pretty girls each dressed in a different costume, one representing Cuba, another the Phillipines, another the American girl, and another an Indian maiden. At each corner of the platform of the float were white columns, gilded at the top, and the entire float was appropriately dressed. Two horses, hitched tandemwise, hauled the float. At the head of each horse were two attendants who were four young men dressed in the costumes of the Indian, the Phillipino, the Cuban, and the Mexican." The E.C. Nichols Dry Goods Co. operated at 35 Main Street. Charles A. Robbins served as company vice president and superintendant, William E. Quirin as president and treasurer. Robbins lived in Bangor, but his partner Quirin, according to the 1912 Bangor city directory, did not live in the Bangor area, as Manchester, New Hampshire is listed as his residence. The company ad on page 253 of the city directory calls the company the "Shopping Centre of Eastern Maine." Everett F. Hartwell ran a decorating business at 35 Main Street.